Shell moderately large, lentelliptical (1,74 its diameter in length), and with two medullary shells, innermost of which is oval, and in which surface of cortical shell is armed with spines which are numerous, short (longest 21μ, smaller ones half as much), generally conical, freely scattered over surface and especially bunched at two opposite narrowed poles of shell where they are longest, straight or curved, sometimes bifurcated, and arising as sepaloid points from subhexagonal meshwork; cortical shell simple, but medullary shell doubled, innermost of latter oval, outermost and cortical shell both lentelliptical, inner medullary shell about 0,5 diameter of outer one, and latter 0,55 diameter (long axis) of cortical shell, two inner shells smooth and thin-walled; radial beams very numerous (at least as many as surface spines with which they appear to connect on inner side of cortical shell) generally thin, wirelike rods; surface of cortical shell with strong, coarse, subhexagonal meshwork, each pore enclosed by a deep funnel, from free angles of which arise surface spines; cortical pores subcircular to subelliptical, sometimes oddly shaped, nearly uniform in size (generally 4.4-10 μ in diameter), some of them in fused pairs. 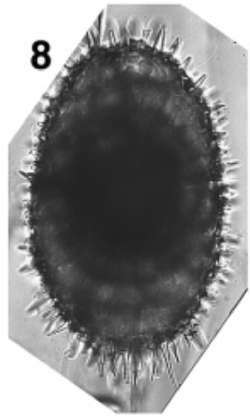 Length of cortical shell, 180 μ, of outer medullary shell, 109 μ, of inner medullary shell, 51 μ.
Larnacantha polyacantha n.sp. differs from described species most prominently in peculiar polar bunching of longer radial spines and in its narrowed cortical shell which is less stout than in other forms. One of more abundant species in this collection. medium-sized, irregularly arranged pores, frames are absent in most specimens. The inner structure is made up of weakly increasing, single or double spirals, although in some specimens the internal structure is so spongy that the spirals are nearly undetectable. In some subspecies the shell shows characteristic deviations from a simple ellipsoidal shape, which is caused by the development of caps at the poles. A pylome is obvious in most specimens. Remarks. Larcopyle polyacantha was ﬁrst described by Campbell & Clark (1944) from North Paciﬁc (California coast) sediments and, to some degree, can be considered a ‘garbage bag’ type of taxon. The various forms in this group are related closely to each other and (as also noted by Campbell & Clark) show a great range of morphological variation. Diﬀerences between forms are subtle and in poorly preserved individuals a precise assignment may not be possible. In this study the majority of the morphotypes that exist in this group have not been diﬀerentiated, particularly in the early Neogene. However, there is a formal division of Larcopyle polyacantha into three subspecies – L. polyacantha polyacantha, L. p. titan and L. p. amplissima. It has been decided to distinguish the L. p. titan and L. p. amplissima morphotypes as they provide useful stratigraphic information. Larcopyle polyacantha titan, under the name Prunopyle titan, has been used extensively for biostratigraphy in late Neogene Antarctic sediments for many years. P. titan is a species that was also described originally by Campbell & Clark (1944) from California. True P. titan morphotypes, however, are seen in Antarctic sediments only in the early Neogene, where they are generally rare. This form, in the new combination Larcopyle titan, is re-illustrated from the original type series material. There are many diﬀerent morphotypes within this group, some of which appear to be restricted to the Early or Middle Miocene in the Antarctic. There are transitional specimens between L. p. polyacantha and the other named subspecies (L. p. titan and L. p. amplissima) which occur throughout the stratigraphic intervals in which these latter subspecies are found. In the early Miocene, there are gradational specimens between L. p. polyacantha and several of the other species described in this study, including L. nebulum and L. hayesi (variety irregularis). There also appear to be some regional diﬀerences: for example, specimens that correspond to Campbell & Clark’s (1944) ﬁgured specimen number 7 (pl. 7) from California have not been seen in this Antarctic material. The specimens illustrated by Nigrini & Lombari (1984) are somewhat larger, and have a thinner cortical shell, than is typical of most of the Antarctic material studied here, but otherwise fall within the range of variability for this species group. Description. Specimens of Larcopyle polyacantha without polar caps, with a generally regular ellipsoidal shape and relatively equally spaced whorls from the centre to the outer wall of the shell. Remarks. All of the specimens of Campbell & Clark (1944) examined so far can be assigned to this subspecies. The type specimen for this subspecies is chosen from the original type series material of Campbell & Clark, who did not explicitly designate a holotype specimen.